Did the title sell you? Please say it did! If not, I hope I can change your mind by the end... 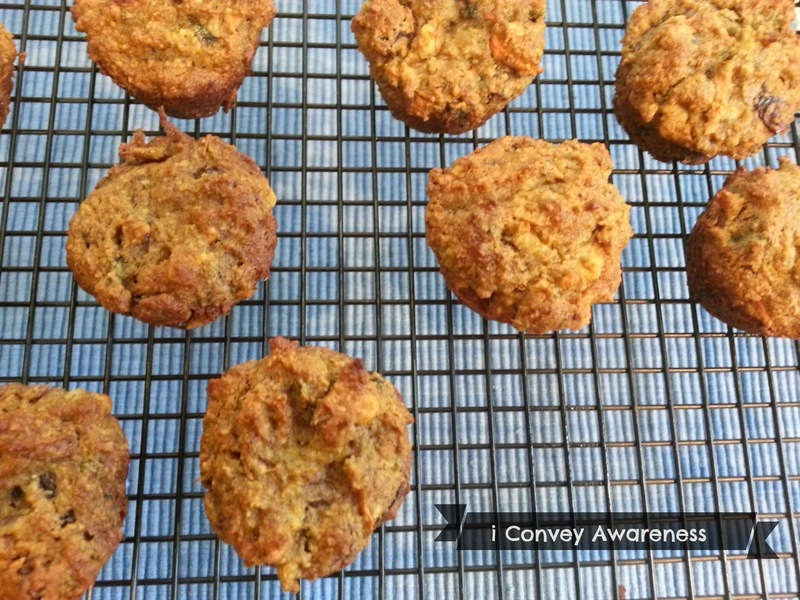 Yes, Conveying Awareness has done it again! 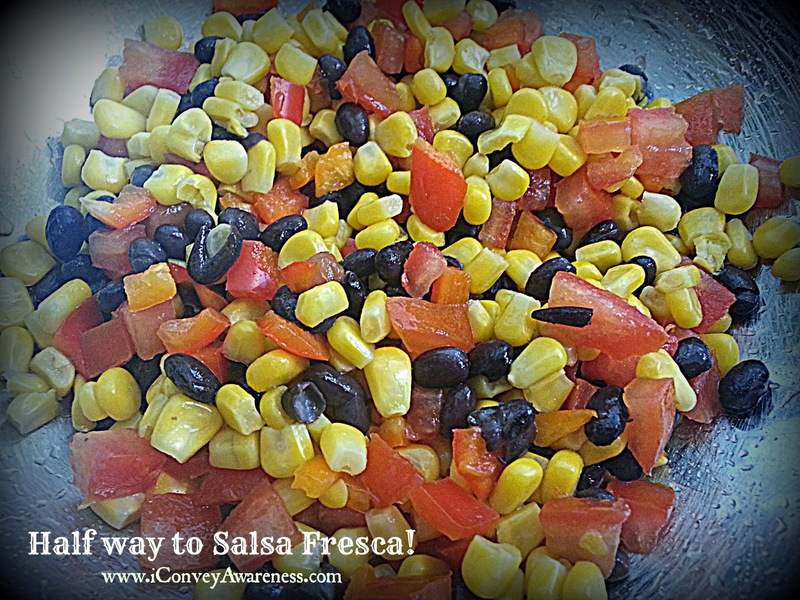 Look right here for an easy and satisfying meal! 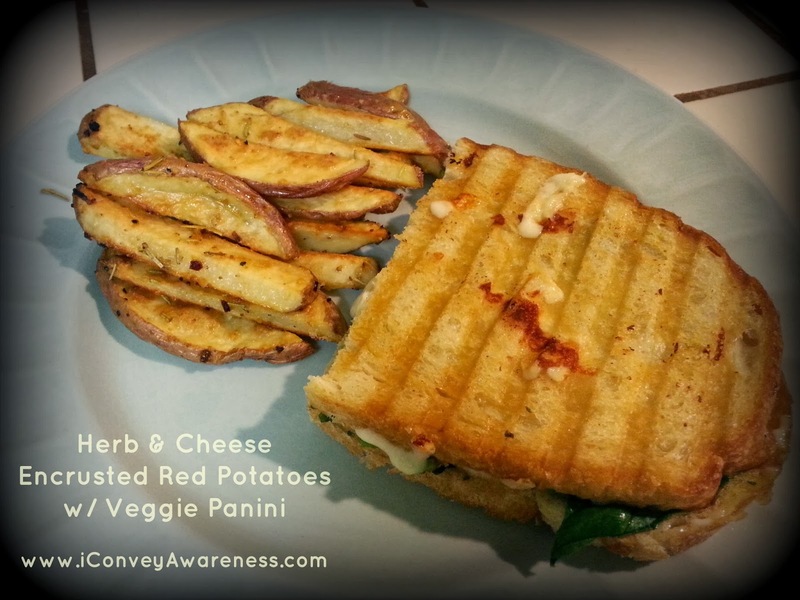 Enjoy a vegetable panini paired with herb & cheese encrusted red potatoes. YUM-O! 1. 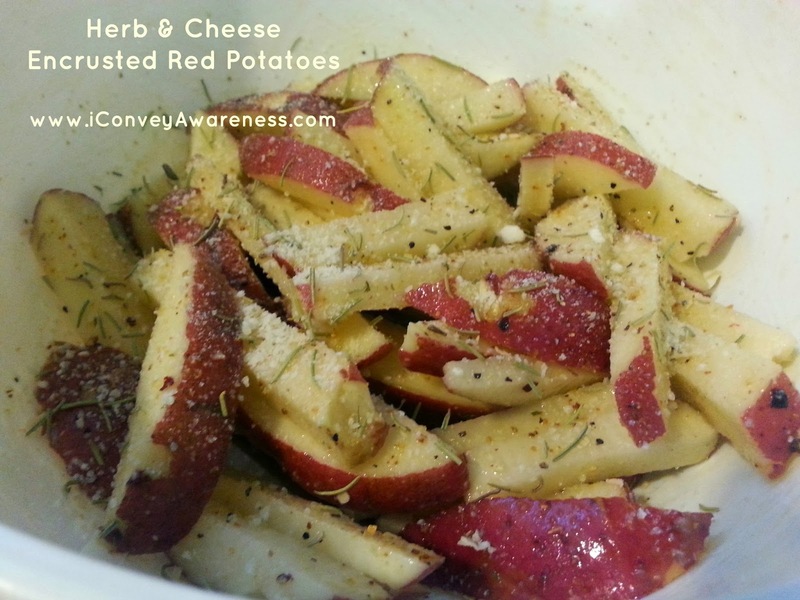 Coat sliced potatoes in EVOO. Sprinkle herbs of choice and bake in a lined pan (can use parchment paper) for 40 minutes in a 425* oven. 2. While fries are baking, heat the Cuisinart grill (that's what I use) to medium-high heat. 1. Add pesto to inside slices of bread. Top with sliced avocado (seasoned with S&P if you like), fresh spinach, and shredded mozzarella. Place the slices together and spread butter on outside of bread. Place in Cuisinart grill until the outside of the bread is golden brown and the cheese has melted in the middle - about 4 minutes. 2. Repeat steps until you've made all of the sandwiches (panini) you'd like. 3. Serve the panini with fries (herb & cheese encrusted potatoes). Labels: Veggie Panini with Herb "Fries"
This recipe was made in preparation for my May Healthy Eating Presentation which will be using all fresh ingredients; green and yellow light foods from the L.E.A.N. nutrition philosophy. This recipe is family friendly. It is colorful. 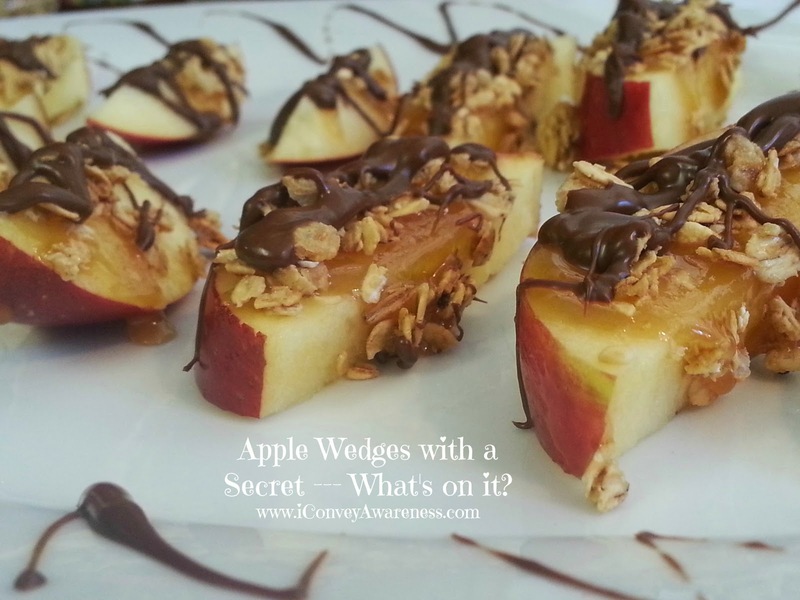 Easy to make and fun to eat! (You may need to lessen the seasoning a bit - you get to decide how much you want!) 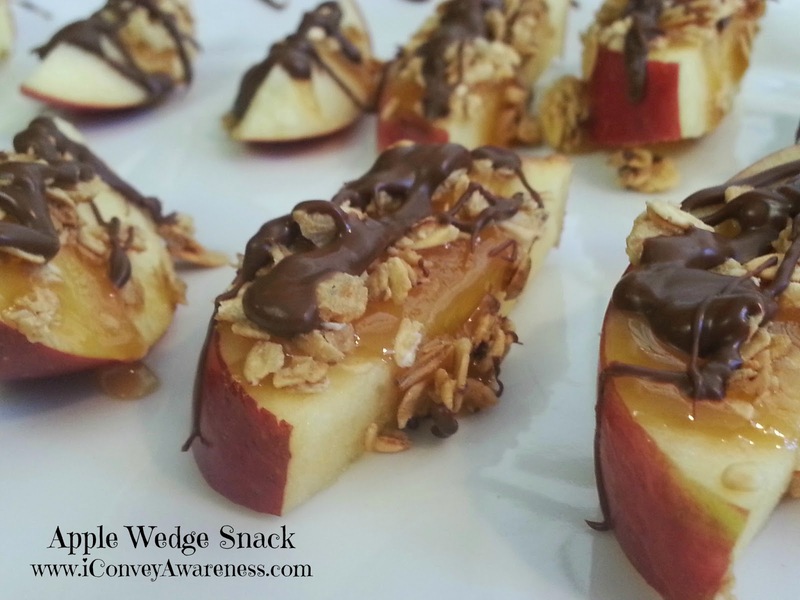 This recipe is gluten, grain, and dairy free! It is mostly organic, local and/or non-GMO. Serves 4. Prep time: 10 minutes. Ready to serve time: 40 minutes total. 1. In a small bowl, add the 3 tbs of olive oil, the juice of 1 lemon, the 1 tsp of sea salt, and the 1/2 tsp of cayenne. Stir. Set aside. 2. Dice the shallot and then toss with the olive oil mixture (step 1). Stir. 3. Prepare other ingredients in a separate bowl. 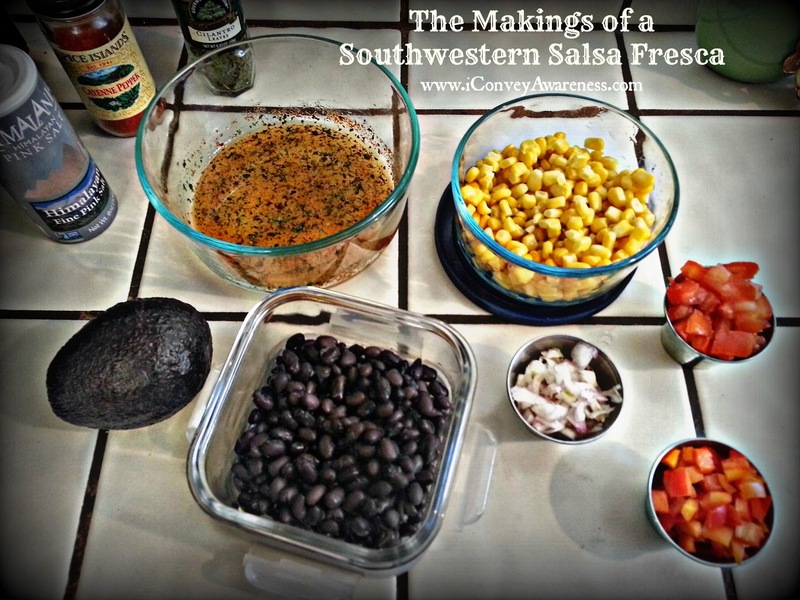 Add the corn, black beans, tomatoes, and sweet peppers. Season with dried (or fresh) cilantro. Toss. 4. Pour the olive oil mixture with the diced shallots in with ingredients in step 3. Stir until well combined. You may need to add more seasoning to your taste buds here. Cover. 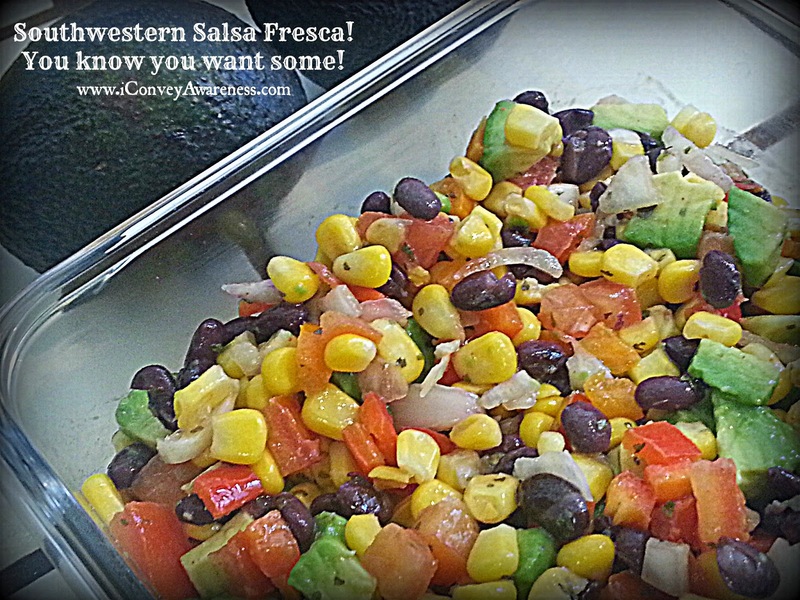 Refrigerate for 30 minutes to let the flavors meld. 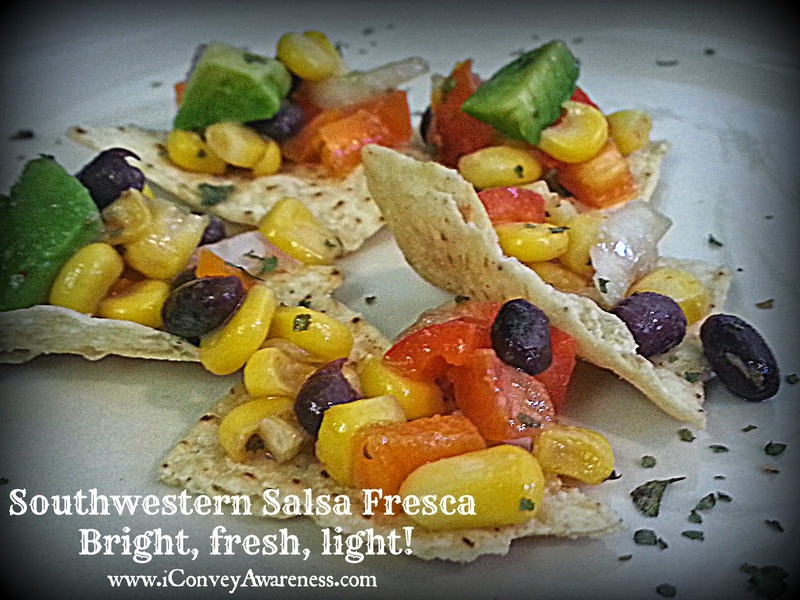 Now share your favorite fresh foods salsa in the comments section. You're invited to leave a link to your blog, too! 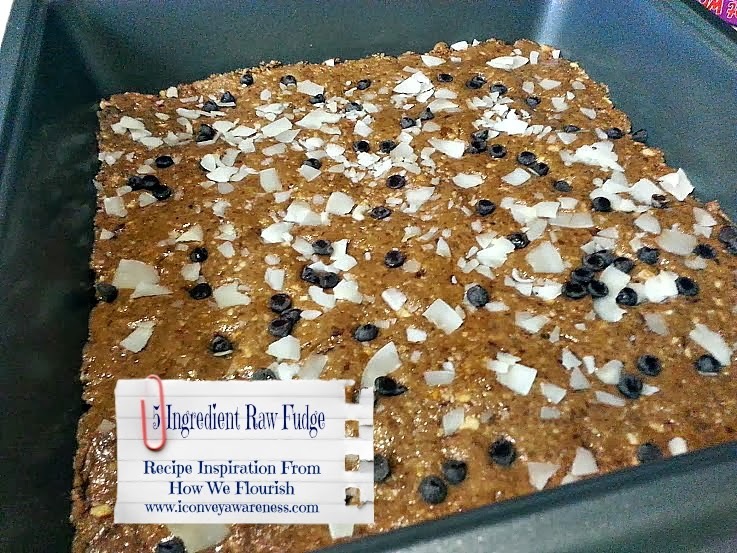 I'm a member (currently an admin) of a group on Facebook called Real Food Cafe and a fellow blogger, Chloe of How We Flourish, shared her recipe for Raw Almond Chocolate Brownies. Three words got me there so I peeked and BAM --- I made them that day! A few notes worth mentioning: I have a Vitamix and knew that I couldn't make the recipe as was listed because the dense almonds and dates need a liquid to move through the blades with ease. I also substituted one of the ingredients. You can get her recipe on the link above and you can get mine below. I renamed mine to fudge because of the added coconut oil which made the 'brownies' slightly wet to the touch and they'll definitely melt in your fingers. 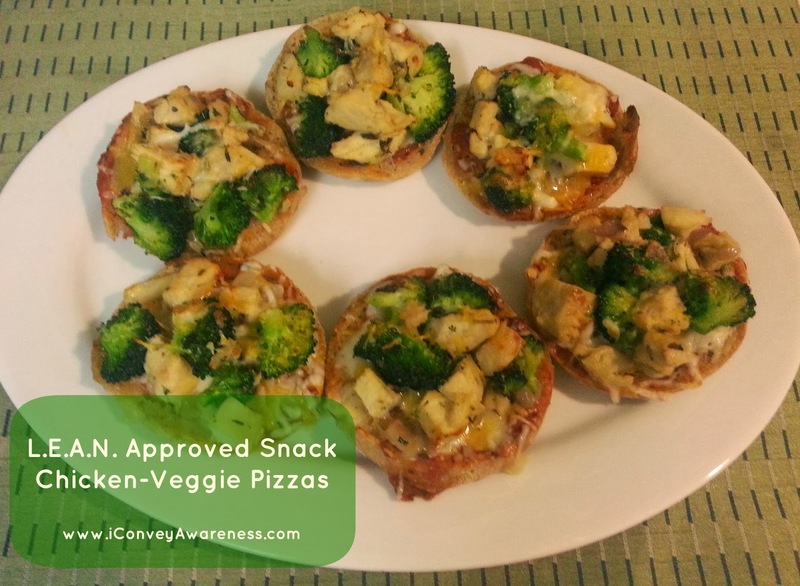 The recipe is 5 ingredients but including the optional toppings, there are seven in total. The recipe is still raw. 1. *If you've got whole almonds, you can make almond meal in your Vitamix in under a minute. Keep on variable low and up to 7 using tamper to move the almonds towards the blades. If you made almond meal in your Vitamix then remove it and set aside. 2. Pour in the dates and the peanut butter and 1 tbs of melted coconut oil and blend on variable low between a 5 and 7 using tamper for about 30 seconds. Turn off. 3. Add in the chocolate Complete (or raw / plant based chocolate, or cocoa / cocao powder) and 1/2 of the almond meal and 1 tbs of melted coconut oil. Turn on variable low between a 5-7 for about 30 seconds. Turn off. 4. Add the remaining almond meal and the last tablespoon of melted coconut oil. Blend on variable low until well mixed. You'll need to keep an eye on it as to ensure the ingredients are mixing thoroughly. 5. Pour in a dish of your choice. Spread it out and flatten it with the back of a spoon. 6. Sprinkle the chocolate and coconut chips and press into the fudge. 7. Refrigerate until ready to devour. It stores up to week, if it'll last that long. *Final note, if you already have almond meal on hand and/or don't have a Vitamix, you can omit the coconut oil and make the recipe in your food processor. Be sure to subscribe to my blog so that you don't miss recipes and other helpful tips in your journey to wellness. If you're interested in learning more about how to choose quality, real foods for your family, you may enjoy my online L.E.A.N. Start "Nutrition Simplified" classes - they are for families that are starting out in their wellness journeys; individuals who need a new beginning or anyone who is looking for accountability and encouragement. You can learn here. L.E.A.N. is an acronym - Lifestyle, Exercise, Attitude, Nutrition. It is a philosophy taught by coaches certified from the Sears Wellness Institute (like me!). We teach quality and integrity of foods like nutritionists do and our basic foundation is the Traffic Light Eating (TLE) concept. When we think of foods in the 3 colors of a traffic light, we can quickly ascertain which foods fuel our bodies. Green and yellow light are the categories you want to stay in at least 80% of the time! More information on TLE can be found on a post I wrote in March 2013. 1. Line a cookie sheet with parchment paper and separate the 3 english muffins. Set it up like an assembly line. This is a great time to get the little ones to help! 2. While the little one is separating the English muffins and putting them in two rows of three, heat 1 tbs EVOO on medium heat in a skillet. Prepare veggies for a quick stir-saute. 3. Using a silicone basting brush (like this) put a little EVOO on each slice of the English muffins. 4. Cook the veggies for 6 minutes, stirring occasionally and seasoning with oregano. Stir in the chopped chicken breasts and finishing heating for 3 minutes. 5. Turn on your oven's broiler to low. 6. After all English muffins are topped with EVOO, use the same basting brush to top them with spaghetti sauce. Make it as thick as you'd like. 7. 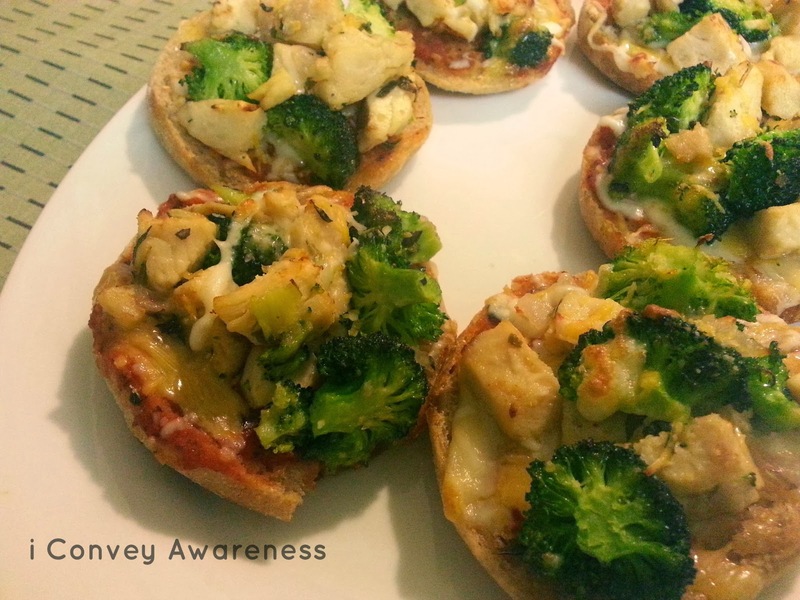 Top the English muffins with the cooked veggies & chicken and if using, sprinkle mozzarella cheese on top. 8. Place in the broiler for up to 10 minutes. Remove. Cool. Enjoy!! If you'd like your English muffins to be more crunchy than soft, you can place them in the broiler with the EVOO (step 3) for 4 minutes. Then carefully (if children are helping), remove from oven and top with spaghetti sauce. Follow directions 7 & 8. I enjoy putting resources into the hands of people who want to dive deeper into wellness. One of my favorite activities is holding free presentations for communities in need. I've been invited back twice since holding my first talk with the local diabetes chapter. They would like me to come back monthly but due to time constraints, I'll be back every quarter. For the first time since moving to the High Desert, I was able to put on a collaborative event (this makes my heart sing!). 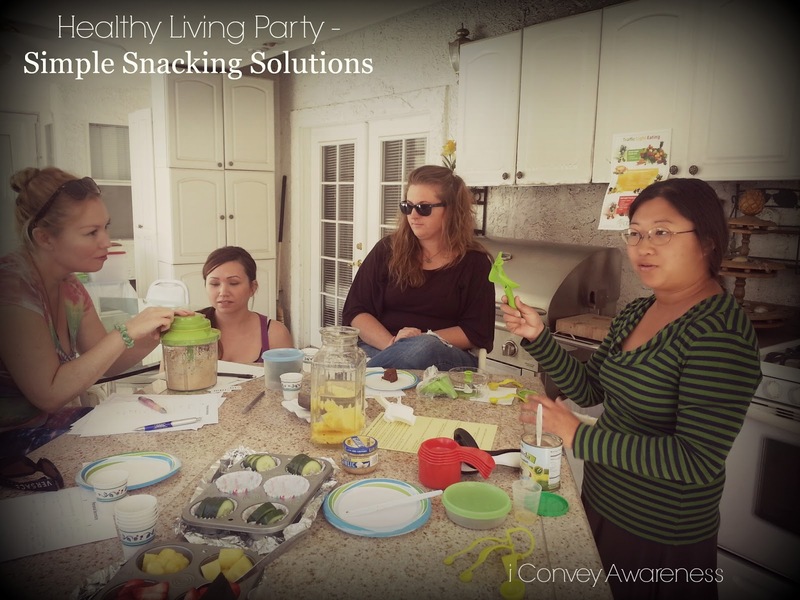 My friend and I teamed up in March to give busy parents some helpful ideas on how to make healthy foods in a jiffy and with ease. We both know this is a need in our community as we live in a food desert. My neighbor was so kind to let me use her outdoor shaded kitchen for our talk. 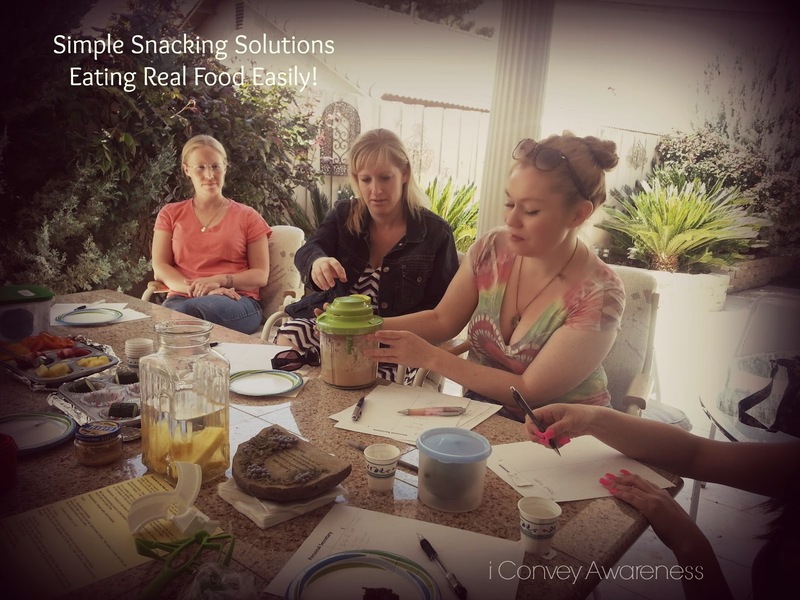 We demonstrated 4 healthy recipes that the guests could sample. My friend demonstrating the chopper after serving our guests the hummus dip. I shared why small nutrient dense meals are preferable over 3 large meals. We demonstrated a hummus dip with vegetables and a grazing tray. I shared the importance of eating a variety of fruits and vegetables. I blended my signature green smoothie. (A new recipe to follow with images.) My friend demonstrated her container that prolongs the freshness of fruits and vegetables and she also demonstrated a veggie omelet using her tools. We served pineapple infused water in between the demonstrations. All adult guests left with a door prize and two guests went home with a giveaway valued at $35 each. We are looking forward to doing more of these events in the months ahead. Our goal is to do these "solution" based talks several times a year. Each talk will somewhat overlap the previous and they will build upon one another. All the recipes are using mostly green and yellow light foods. More on this color, search Traffic Light Eating on my blog or click the link above in #3. The outline and discussion points for our April talk will be shared soon. Stay tuned. Wrap it with prosciutto. It is delicious! I also added basil pesto and crumbled feta before wrapping the asparagus. It was a nice added touch! The prosciutto I used was nitrate free. You can make your own pesto in under a minute in your vitamix as seen here. Roast the wrapped asparagus in a 400* oven for 10 minutes and about half way through drizzle EVOO on the ends of the asparagus. 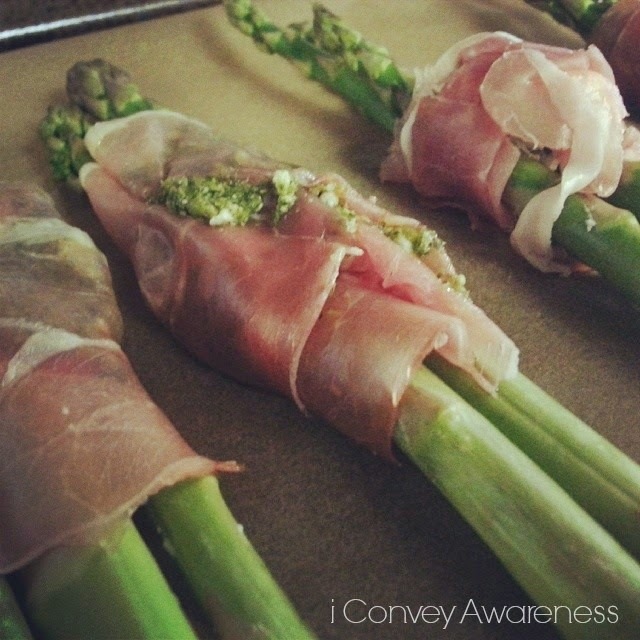 The prosciutto is already cooked and if your asparagus is really thick, you may need to add a few more minutes to the roast time. Sprinkle with sea salt when out of the oven. Cool for 2 minutes. Nope, this is not fruit cake. Wouldn't you agree that it is extreme joy making a recipe for the first time and your family raves for it!?! 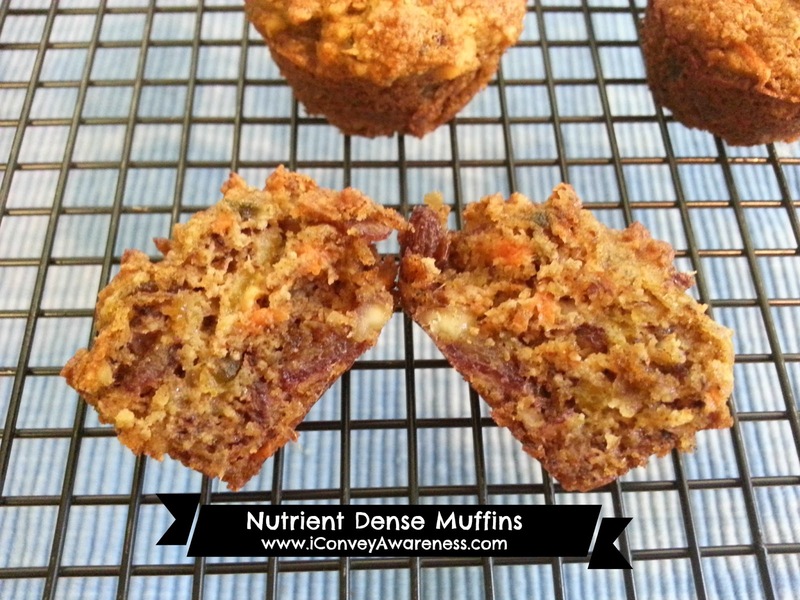 This is what happened when I made the Gluten-free, Sugarless Carrot Walnut Banana Muffins from This Original Organic Life. I'm going to share the few minor changes I made to the recipe. The recipe made 36 miniature muffins. Though it's probably not a good idea, I did eat some of the raw batter before baking and it was good and had a nice naturally sweetened taste. 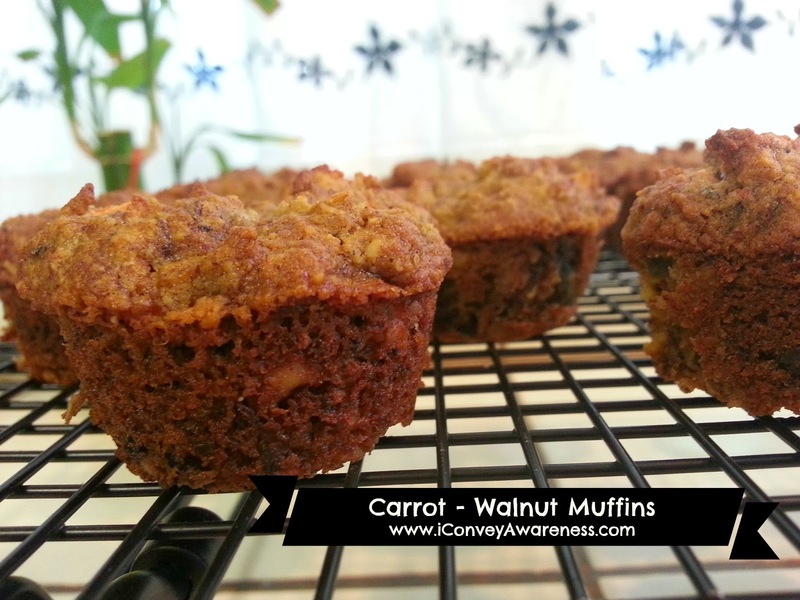 I was surprised of how yummy these muffins were after baking and was stoked that my 5 year old asked for more after eating 4 minis. I had some for breakfast the next day. YUM-O! You have to try this recipe. It is so good! Rachel of This Original Organic Life shares some ingredient substitutions on her blog. Now that I've peaked your interest (again), be sure to visit her blog post for further inspiration!